Dovetailed drawers and mortise and tenon joinery are quality trademarks in our Amish Seguso Modern Hutch, which is made-to-order especially for you. 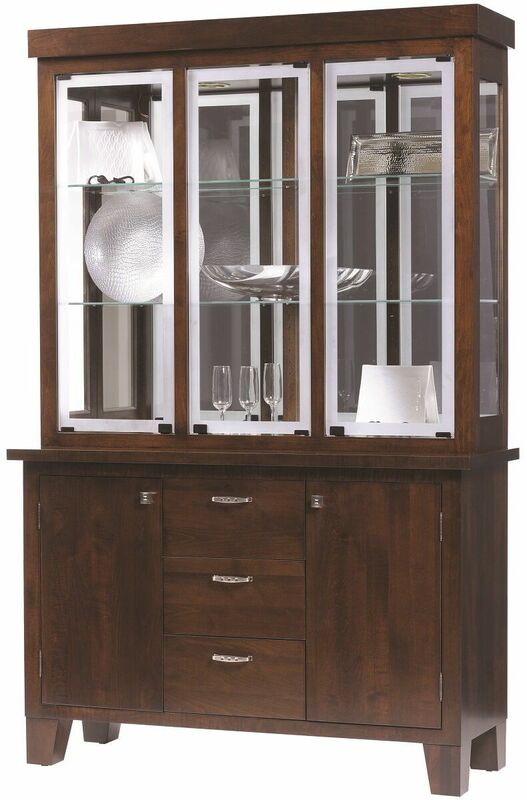 This contemporary, solid wood hutch features intricate details from the bold, straight moulding to the linear feet. Perhaps the defining feature, the Seguso Modern Hutch offers three full, flat glass doors with frosted edge bands. A mirror back display with glass shelving and a touch lighting system creates an open, updated appeal. Create your one of a kind Seguso Modern Hutch by completing our Create Your Piece menu. Your piece will be stained to your liking and then carefully finished with a catalyzed conversion varnish to ensure beauty and longevity. 51"W x 18"D x 78 1/2"